The Town Clerk's office is responsible for the upkeep of all of the Town's records. The Town Clerk issues Dog Licenses, Marriage Licenses, Death Certificates, Birth Certificates and certified copies of each. The Town Clerk also keeps on file all Burial Records. The Town Clerk is responsible for recording the minutes for each Town Board meeting. Certified copies of Marriage Licenses, Death Certificates and Birth Certificates are available for a $10 fee per copy. Marriage certificates - if on file for at least 50 years and the couple are both known to be deceased. A couple who intends to be married in New York State must apply in person for a marriage license. The application for a license must be signed by both parties in the presence of the clerk. A representative cannot apply for the license on behalf of the couple. When should we get our license? Although the marriage license is issued immediately, the marriage ceremony may not take place within 24 hours from the exact time that the license was issued. A marriage license is valid for 60 days, beginning the day after it is issued. The marriage license costs $40 and can be paid by check or cash. This fee includes the issuance of a Certificate of Marriage Registration. Additional Certificate of Marriage can be obtained by this office for $10 per copy. A Birth Certificate, Baptismal record, or Naturalization record and a Driver's license, Passport, Employment ID, or Immigration record must be provided to obtain a marriage license. Divorce papers or death certificates are also needed, if applicable. Dogs in the Town of Westville must be licensed with the Town Clerk (358-0026). Current Rabies Certificate is required. Licenses must be renewed annually; $10 for spayed/neutered and $25 unaltered dogs. If the dog is spayed or neutered - a certificate from a licensed veterinarian showing that the dog has been spayed or neutered, unless this proof is already on file with the Town Clerk. ALL dogs four months or older must have proof of a rabies vaccination signed by a licensed veterinarian. 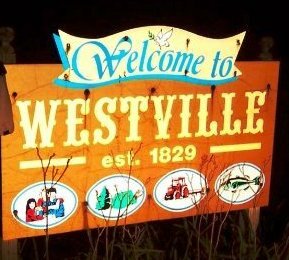 Checks payable to the Town of Westville for the appropriate license fee. Handicap tags belong to the person and not the vehicle. Therefore, the tag can be moved from vehicle to vehicle. Only one tag can be issued per person. The website below is a direct link to the Department of Motor Vehicles application for a handicap tag. Applications are also available in the Town Clerk's Office. The form must be completed by a physician and a valid driver’s license is required. Cemetery Easements may be purchased from the Town Clerk for any of the Town Cemeteries at the cost of $200.00 per plot.